Please be aware the Bank has received reports of Bank impersonation on social media. We have taken steps to resolve the fraudulent account and activities. 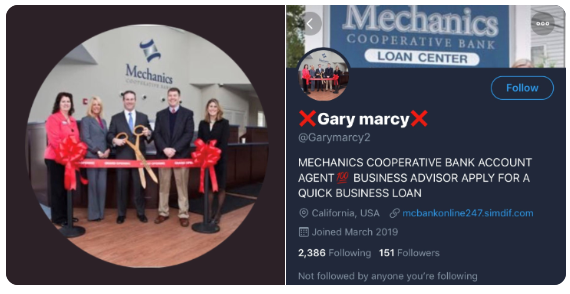 Mechanics Cooperative Bank personnel will never request account information via social media. Mechanics Cooperative Bank is committed to protecting your personal account information and reducing the potential for fraud. As a result, we have invested in a Fraud Detection Program that actively tracks transactions associated with your accounts. The Fraud Detection Programs works around the clock, 365 days per year and includes direct customer communication when necessary. While the Bank would NEVER call and ask you to verify your personal account information (such as your account number or social security number), we may call and ask you to verify recent transactions including merchant location and amount. These verifying phone calls help ensure any possible fraud is detected and removed immediately to limit exposure. We appreciate your cooperation if you ever receive one of these calls. The Bank will also NEVER send unsolicited emails or other types of communications requesting you to verify any of your personal or financial information. We will never send a link to our website through email without telling you first or without you requesting us to do so. If you receive a suspicious request please report it to us at report_abuse@mechanics-coop.com. If you believe that you gave out sensitive information regarding your accounts please call us immediately at 508-823-7744. We appreciate your business and thank you for banking with Mechanics Cooperative Bank. Mechanics Cooperative Bank will never send unsolicited emails or other types of communications requesting you to verify any of your personal or financial information. We will never send a link to our website through email without telling you first or without you requesting us to do so. Industry reports are being received, of a telephone scam involving fraudsters attempting to obtain personal information from cardholders. Although no incidents have been reported from our cardholders, we should be informed of these scams and whenever possible, reinforce positive, safe behavior through discussions with our customers. Cardholders have received computer-generated calls claiming to be from their financial institution. The calls claim their accounts have been frozen and then direct the cardholder to call a toll-free number to leave their debit card information in order to reactivate any cards. The toll-free number includes a recorded message that asks the customer to key their account number, card expiration date, and PIN. Make sure you [i.e. cardholder] initiate the contact, and the institution verifies your identity with questions only you would know. To verify whether a call is legitimate, call your bank or visit its website, using phone numbers or internet addresses from your bank statement or account documentation. Do not call back a number provided over the phone or click on a link in an email. Most communications will include something that will concern or excite the victim. If you have been the victim of a scam, file a complaint at local law enforcement. According to OnGuard Online, phishers send an email or pop-up message that claims to be from a business or organization that you may deal with – for example, an Internet service provider (ISP), bank, online payment service, or even a government agency. The message may ask you to “update,” “validate,” or “confirm” your account information. Some phishing emails threaten a dire consequence if you don’t respond. The messages direct you to a website that looks just like a legitimate organization’s site. But it isn’t. It’s a bogus site whose sole purpose is to trick you into divulging your personal information so the operators can steal your identity and run up bills or commit crimes in your name. Spyware is software installed on your computer without your consent to monitor or control your computer use. Clues that spyware is on a computer include a barrage of pop-up ads, a browser that takes you to sites you don’t want, unexpected toolbars or icons on your computer screen, keys that don’t work, random error messages, and sluggish performance when opening programs or saving files. Use anti-virus software and a firewall, and keep them up-to-date. Don’t click on links inside pop-up windows. Don’t click on links in spam that claim to offer anti-spyware software; you may unintentionally be installing spyware. Many experienced Web users have learned how to recognize spyware, avoid it, and delete it. According to OnGuard Online, all computer users should get wise to the signs that spyware has been installed on their machines, and then take the appropriate steps to delete it. The bottom line for online threats like phishing, spyware, and hackers is identity theft. ID theft occurs when someone uses your name, Social Security number, credit card number or other personal information without your permission to commit fraud or other crimes. That’s why it’s important to protect your personal information. If your personal information is accidentally disclosed or deliberately stolen, taking certain steps quickly can minimize the potential for the theft of your identity. Close compromised credit card accounts immediately. Consult with your financial institution about whether to close bank or brokerage accounts immediately or first change your passwords and have the institution monitor for possible fraud. Place passwords on any new accounts that you open. Avoid using your mother’s maiden name, your birth date, the last four digits of your Social Security number (SSN) or your phone number, or a series of consecutive numbers. Call the toll-free fraud number of any one of the three nationwide consumer reporting companies and place an initial fraud alert on your credit reports. This alert can help stop someone from opening new credit accounts in your name. An initial fraud alert stays on your credit report for 90 days. When you place this alert on your credit report with one nationwide consumer reporting company, you’ll get information about ordering one free credit report from each of the companies. It’s prudent to wait about a month after your information was stolen before you order your report. That’s because suspicious activity may not show up right away. Once you get your reports, review them for suspicious activity, like inquiries from companies you didn’t contact, accounts you didn’t open, and debts on your accounts that you can’t explain. Check that information — like your SSN, address(es), name or initials, and employers — is correct. Contact the agencies that issued the documents and follow their procedures to cancel a document and get a replacement. Ask the agency to “flag” your file to keep anyone else from getting a license or another identification document in your name. Continue to read your financial account statements promptly and carefully, and to monitor your credit reports every few months in the first year of the theft, and once a year thereafter. For more information on getting your credit reports free once a year or buying additional reports, read Your Access to Free Credit Reports. Protecting your debit card from fraud requires constant monitoring at all hours of the day which is why Mechanics Cooperative Bank now provides free automated fraud detection and alerts for your debit card. If potentially fraudulent transactions are happening with your debit card, we will contact you immediately to confirm the accuracy of these purchases and take any appropriate action as needed. Please remember: Mechanics Cooperative Bank will never call, text or email you requesting your personal information, including social security number, account passwords or PIN numbers. These fraud detection phone calls will only reference specific purchases made with your debit card and will not ask for any confidential information. If you receive a suspicious phone call or email asking for your personal or confidential information – do not respond. Immediately contact us at 1-888-MECHANICS (632-4264). Debit card transactions are monitored for purchases outside your normal purchasing patterns, unusual timeframes and geographical locations, or purchase patterns that are consistent with previously identified fraud trends. This is the fraud prevention department at Mechanics Cooperative Bank calling for <CUSTOMER NAME>. We need to verify some recent activity on your debit card ending in #1234. In order to prevent possible difficulties using your card, it is important that you call us back at your earliest convenience, toll free at 1-800-528-2273 to verify this activity. Thank you. The text message will contain our financial institution name, dollar amount of the transaction and merchant name. You will reply with “Yes” if you authorized the transaction. You will receive a confirming text message and can continue to use your card with confidence. Replying “No” means you have not authorized the transaction. You will receive a confirming text message and you will be contacted immediately by a fraud specialist to protect your account. Please answer this important call. To opt-out of Mechanics Cooperative Bank Text Fraud Alerts, reply STOP to the message. An unsubscribe message will not be sent confirming the cancellation, and no more fraud alert text messages will be sent. Text from Mechanics Cooperative Bank – 33748: Free Msg: Mechanics Cooperative Fraud Dept: Did you make a charge of $54.45 at Grocery Store #12 with acct ending in 1234? Yes, reply yes. No, reply No. To Opt out reply STOP. If YES reply received: Free Msg – Mechanics Cooperative Fraud Dept: You have confirmed a purchase of $22.22 at Grocery Store #12. We apologize for any inconvenience. Your acct can now be used without concern. If NO reply received: Free Msg – Mechanics Cooperative Fraud Dept: Thank you for your reply. A fraud specialist will call you immediately to protect your account. Please answer this important call. Do not approach an ATM if suspicious persons are nearby. Consider having someone accompany you when the ATM is used later than a half hour after sunset. Never approach an ATM after dark if the lights at the ATM site do not appear to be adequate. Do not leave your vehicle running or keys in the ignition when using a walk-up ATM. Consider canceling the transaction, pocketing your card and leaving if you notice anything suspicious while transacting business at the ATM. Minimize time at the ATM by having your card out and ready for use. Never leave the ATM with your wallet and/or cash exposed. Memorize your PIN. Do not write your PIN on or carry it along with your card. Never give your PIN over the telephone. Banks will never ask for your PIN in person or over the telephone. Shield the ATM keyboard with your body so others cannot observe the PIN being entered. If followed from an ATM, go to an area where there are people and activity. Always keep the car running and door locked when using a drive-up ATM. When possible, keep at least one car length distance between your car and any vehicle in front of you when waiting to use a drive-up ATM. Before lowering your car window to use a drive-up ATM, check for strangers or suspicious persons. If a stranger approaches, drive away from the area at once. Report all crimes to the operator of the ATM and to local law enforcement officials immediately. Always check the ATM machine for any suspicious devices around or attached to the unit. Passwords are unique strings of characters that provide, in conjunction with a User ID, access to an information resource. Passwords are an important aspect of information security because they are the first line of defense in protecting your information online. Passwords are intended to be difficult to guess but still easy to remember. A poorly chosen password may result in the compromise of confidential information that could adversely affect both the Bank and its customers. Be aware of the characteristics of strong and weak passwords in order to ensure adequate protection of your information online. The password contains less than eight characters. The password is a word found in the dictionary. Names of family, pets, friends, co-workers, sports, teams, movies, license plate numbers, birthdates, etc. Are not a word in any dictionary, language, slang, dialect, jargon, etc. As a general practice, you should never write down any passwords. Instead create passwords that can be easily remembered without using any characteristics of a weak password. One way to accomplish this is to create a password based on a song title, affirmation, or other phrase. For example, the phrase might be “Every day I write the book” and the password could be “ED1rtb@@k” or some other variation. Do NOT provide your password to anyone who requests or demands it. We also recommend contacting your wireless service provider to inquire about a possible “data wipe” of the phone remotely. Often time’s wireless carriers can remotely delete all of the information on your phone including text history, applications, browser history and bookmarks. How do I disable my phone from access to mobile banking? You can disable your mobile banking account, or an individual phone, through your Internet Banking account. 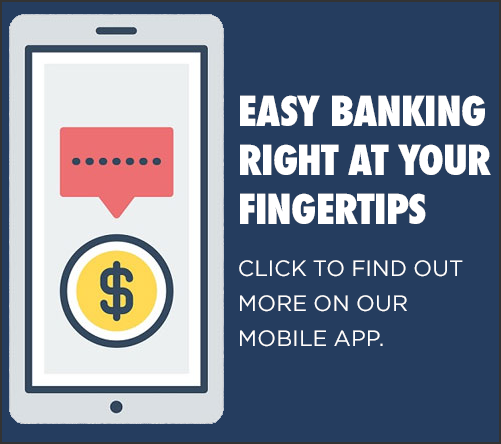 Simply go to online banking and access the Mobile Banking pages. On the My Phones page, find the phone number and select the option Stop using this phone for Mobile Banking. Mechanics Cooperative Bank is proud to offer our customers access to the new Security Information Center. This online module has been specifically created to provide our customers the opportunity to explore topics of interest related to information and bank account security. Please click the link above and select from the courses available to help better understand and protect yourself from fraud and identity theft. Elder financial abuse is a growing problem in the United States. Bank employees are trained to notice red flags like unusual recent withdrawals or a new person accompanying older customers to the bank – behaviors that may identify whether or not a customer is vulnerable or currently a victim of financial abuse. Keep personal information private. Never share your social security number, account information or personal details over the phone or internet, unless you initiated contact with a trusted source. Don’t let a so-called “advisor” pressure you. Never let a new or un-trusted “advisor” pressure you into sharing personal or financial details. They could be a fraudster. Carefully choose a trustworthy person to act as your agent in all estate-planning matters. For more information on scams and fraud, visit AARP. To report suspected elder abuse or exploitation in Massachusetts, call 1-800-922-2275.